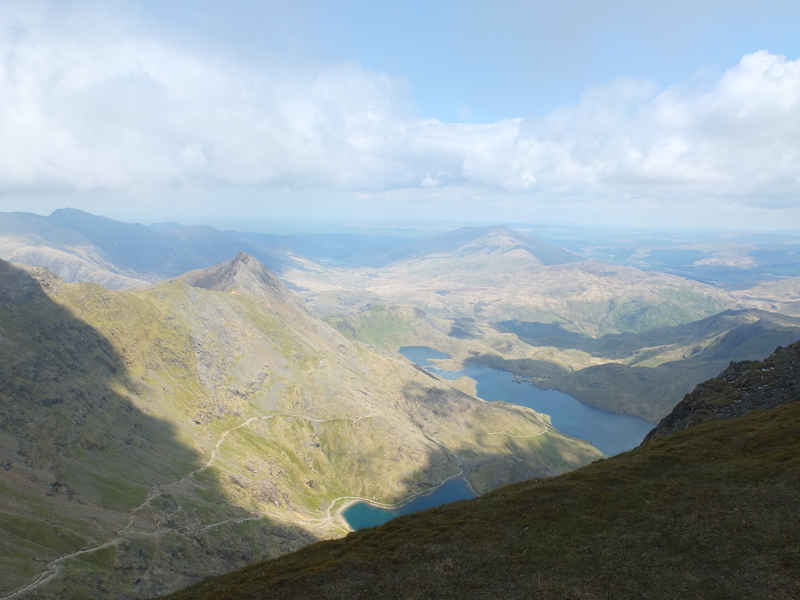 Last weekend’s training hike was Wales’ highest mountain, Snowdon. Martine and Sophie joined me and our new (to us) caravan (we’ve had enough of tents in the UK weather!) as we spent the bank holiday long weekend in Snowdonia. Paul, Debbie and Wallace the Labrador stopped in their campervan on the same site. Saturday morning was glorious, warm and blue skies as Paul, Debbie and I set off down the road to pick up the Snowdon ranger path a few miles away to start the long climb up to the 3560ft (1085M) summit. After the initial climb and about 4.5 miles into the hike we stopped looking down over the Llyn Ffnnon-y-gwas reservoir. It was time for lunch and where Wallace decided that he liked the look of Paul’s ham sandwich and swiftly grabbed it and wolfed it down in the blink of an eye. It was then on to the hard stuff as the path became rocky and steep and it zig-zagged up toward the peak where it intercepted the LLanbaeris path and mountain railway track to the summit. As we rose higher the temperature dropped and we even saw patches of snow hiding in the rocks along the ridgline. The views were spectacular looking our across both sides of this impressively high (by UK standards) mountain. The peak was very busy but we took the obligatory photos as the summit trig point before grabbing a hot drinks and snack and donning gloves and hats. Rested and refreshed we followed the mountain train track down towards Llanberis for a few miles before turning off westwards around Hebron station to make our way around the lower flanks of Moel Eilio and then descending back down to our campsite. At just over 14.5 miles this was a long walk but whilst tired and with empty hydration bladders we kept up a good pace and all felt good the day after. I’ve posted the climb stats and some photos of the day. 15 miles over Snowdon, nice work! Sounds like you’re ready for Kili!